We report the rare occurrence of a trichoepithelioma within a congenital melanocytic nevus in an adult, whose clinical presentation was suspicious for malignant transformation. Dermoscopy was not reassuring, and different from previously described cases of trichoepithelioma. The occurrence on the back of a male was another peculiar finding, as usually TE arises on the face of young women. Histopathology was characteristic, with the exophytic desmoplastic trichoepithelioma surrounded by the melanocytic proliferation, and supported the hypothesis that trichoepithelioma is an acquired condition, probably induced by the release of growth factors and cytokines from melanocytes. We speculate that intense sun exposure, due to the patient’s outdoor working and sporting activities, might have activated the melanocytes, and triggered this very unusual benign proliferation. Trichoepithelioma should be included among the diagnostic pitfalls mimicking malignant proliferation inside a congenital melanocytic nevus. Trichoepithelioma, Melanoma, Congenital melanocytic nevus, Dermoscopy, Histopathological correlation. The occurrence of a nodular growth within a congenital melanocytic nevus (CMN) is a troublesome event that raises suspicion for melanoma, especially in adults. Although the risk of melanoma occurring within small-sized (<1.5 cm) CMN is considered low, a cumulative life-long risk is documented, varying from 2.6 to 4.9% for people older than 60 years [1,2]. Moreover, involvement of intermittently sun-exposed areas, such as the trunk, in individuals younger than 55 years of age, is highly suspicious for malignancy . By converse, proliferative nodules usually develop within giant CMNs, during first decades of life, with only one published case occurring in a small CMN after childhood . We report the rare event of a trichoepithelioma arising within a CMN on the back of a male adult. Although dermoscopy should suggest distinguishing features, our findings were quite different and not reassuring, confirming that sometimes only histopathology is capable to resolve the quandary [5-7]. A 42-years-old Caucasian man presented with a 2-month history of recurrent itching sensation on a melanocytic nevus on his back, present from childhood, becoming darker, and developing a palpable growth on top. Clinical examination revealed a flat brown-blackish pigmented lesion of 14 × 11 mm in diameters, with a tan brown 4 mm papule on the left upper quadrant (Figure 1). Personal and family history was negative for melanoma or other skin cancers. The skin was a Fitzpatrick’s IV type, but the patient reported intermittent intense sun exposure, working as coast guard official (maritime security service) and regularly practicing outdoor sports (triathlon athlete). 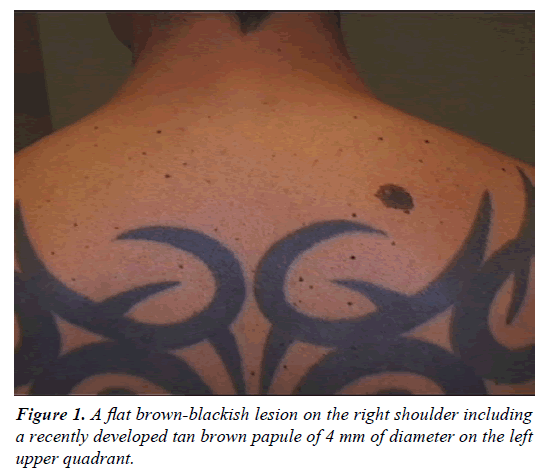 Figure 1: A flat brown-blackish lesion on the right shoulder including a recently developed tan brown papule of 4 mm of diameter on the left upper quadrant. Digital epiluminescence microscopy (FotoFinder dermoscope 2007) showed a large melanocytic lesion, with a compound pattern made of an irregularly distributed reticular network with thicker lines, and peripheral streaks, irregular sizes holes and hair follicle hyperpigmentation, as well as dark brown blotches on light brown background pigmentation (Figure 2). On the left upper quadrant, an oval shaped palpable area showed a structure-less brownish pigmentation, with cropping variable size yellow-white clouds and brown globules. 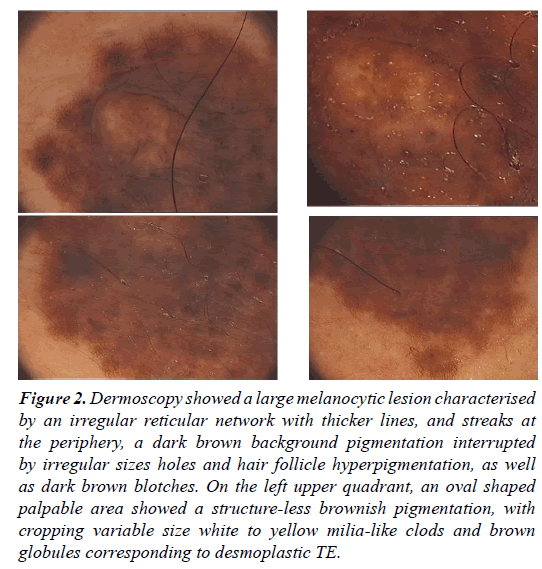 Figure 2: Dermoscopy showed a large melanocytic lesion characterised by an irregular reticular network with thicker lines, and streaks at the periphery, a dark brown background pigmentation interrupted by irregular sizes holes and hair follicle hyperpigmentation, as well as dark brown blotches. On the left upper quadrant, an oval shaped palpable area showed a structure-less brownish pigmentation, with cropping variable size white to yellow milia-like clods and brown globules corresponding to desmoplastic TE. The whole lesion underwent excision, and histopathology confirmed a melanocytic compound nevus, including an exophytic epithelial proliferation (Figure 3). The latter showed a trichoepitheliomatous pattern, composed of multiple horn cysts lined by stratified squamous epithelium, sometimes with comma-shaped projections, and narrow, compressed strands of small basaloid germinative cells, without atypia or mitoses, sparse in a dense fibrous stroma. Some areas of calcification and foreign body granulomas were also present. The melanocytic component was made partly of rounded melanocytic nests, with cytoarchitectural maturation and adnexal follicular structures, together with an irregular lentiginous proliferation, bridging of the rete ridges and discrete papillary dermis fibroplasia, especially around the epithelial proliferation (Figure 4). Immunohistochemistry study of the melanocytic component (HMB45, Melan A) was compatible with CMN, while epithelial islands expressed cytokeratin AE1/AE3, and were negative for Ber-EP4, excluding a basal cell carcinoma. Final diagnosis was of desmoplastic trichoepithelioma within CMN. 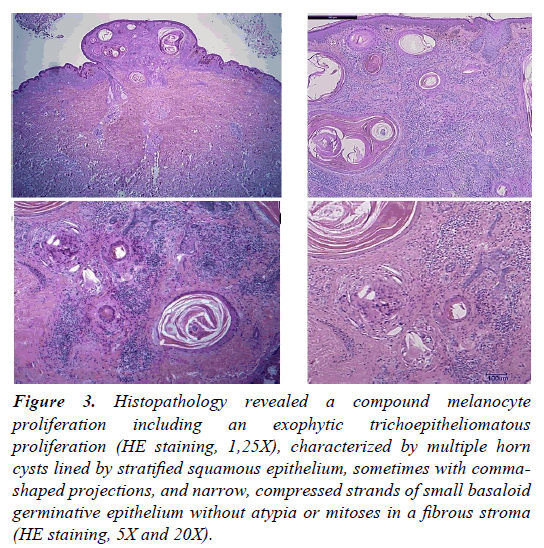 Figure 3: Histopathology revealed a compound melanocyte proliferation including an exophytic trichoepitheliomatous proliferation (HE staining, 1,25X), characterized by multiple horn cysts lined by stratified squamous epithelium, sometimes with commashaped projections, and narrow, compressed strands of small basaloid germinative epithelium without atypia or mitoses in a fibrous stroma (HE staining, 5X and 20X). Figure 4: Adjacent to the trichoepithelioma, the melanocytic nevus showed a lentiginous proliferation with elongation of the rete ridges, and focal proliferation of nested hyper-pigmented melanocytes (Inset d; HE staining, 10X), without pagetoid spread or severe atypia. Trichoepithelioma is a benign asymptomatic skin tumour, presenting as a skin-coloured or yellowish papule, usually on the face, mostly on cheeks and nose . The onset is usually during childhood or in young adults, especially female. The occurrence as collision tumour with melanocytic nevi is possible, especially the desmoplastic variant of trichoepithelioma and is usually considered an acquired condition, fruit of a combined malformation [8-12]. The question whether the nevus precedes the trichoepithelioma proliferation is clearly solved in our case, dealing with a CMN. However, the condition is uncommon, if only one TE was previously reported in CMN . The later occurred after repeated physical treatments to remove the CMN, while no apparent injuries were relevant in our patient, except for occasional excessive sun-exposure. Both TE cases in CMN were characterized by abrupt onset, rapid size increase and pruritus, unusual features in the isolated tumor. Dermoscopy is generally a very useful tool to differentiate benign from malignant proliferation, but some characteristics of the CMN were not reassuring in our case, such as the thick pigmentary network, with peripheral streaks, and eccentric black blotches. Moreover, the raised papule dermoscopy was not suggestive of TE [5-7], showing a homogenous brownish pigmentation instead of pearly to white hue, without arborizing vessels at the periphery, considered characteristic of TE lesion. Different presentation might depend on the dense background pigmentation of the CMN, instead of the minimally pigmented dermal nevi previously described. Brown globules and milialike cists were also prominent, more similar to a seborrheic keratosis, but also described in melanoma cases, especially when arising on CMN . Knowledge of this dermoscopic TE variant might be useful for further observations, to avoid wide excision, which seemed necessary to make the diagnosis in our patient. Histopathology revealed the characteristic TE findings, whose main differential diagnosis is with basal cell carcinoma [11,14-16], excluded in all examined serial samples and by immunohistochemistry. A final consideration regards the interesting hypothesis of a potential paracrine effect of cytokines and growth factors secreted by melanocytes, stimulating the TE proliferation [8-10]. Our patient was alerted by the sudden darkening of the CMN, becoming itching and palpable. The intense intermittent sun exposures, due to professional and sporting activities, might have activated the melanocytes and induced the TE. The case suggests considering the role of sun exposure in further TE observation, and inclusion among diagnostic pitfall for malignant transformation of CMN in adulthood. Price HN, Schaffer JV. Congenital melanocytic nevi-when to worry and how to treat: Facts and controversies. Clin Dermatol 2010;28:293-302. Rhodes AR, Melski JW. Small congenital nevocellular nevi and the risk of cutaneous melanoma. J Pediatr 1982;100:219-24. Shain AH, Bastian BC. From melanocytes to melanomas. Nat Rev Cancer 2016;16:345-58. Kiyohara T, Sawai T, Kumakiri M. Proliferative nodule in small congenital melanocytic naevus after childhood. Acta Derm Venereol 2012;92:96-97. Stoica LE, Dascălu RC, Pătraşcu V, et al. Solitary trichoepithelioma: Clinical, dermatoscopic and histopathological findings. Rom J Morphol Embryol 2015;56:827-32. Lazaridou E, Fotiadou C, Patsatsi A, et al. Solitary trichoepithelioma in an 8-year-old child: Clinical, dermoscopic and histopathologic findings. Dermatol Pract Concept 2014;4:55-8. Oliveira A, Arzberger E, Zalaudek I, et al. Desmoplastic trichoepithelioma and melanocytic nevus: Dermoscopic and reflectance confocal microscopy presentation of a rare collision tumor. J Am Acad Dermatol 2015;72:13-15. Brownstein MH, Starink TM. Desmoplastic trichoepithelioma and intradermal nevus: A combined malformation. J Am Acad Dermatol 1987;17:489-92. Rahbari H, Mehregan AH. Trichoepithelioma and pigmented nevus. A combined malformation. J Cutan Pathol 1975; 2: 225-31. Fairhurst DA, Merchant W, Sheehan-Dare R. Admixed desmoplastic trichoepithelioma and benign melanocytic naevi. J Eur Acad Dermatol Venereol 2008;22:386-7. Mitcov M, Scrivener Y, Cribier B. Desmoplastic trichoepithelioma: A clinicopathological study, including a comparison with morpheiform basal cell carcinoma. Ann Dermatol Venereol 2009;136:501-7. Fukui Y, Ono H, Umemura T, et al. A combined case of desmoplastic trichoepithelioma and nevus cell nevus. J Dermatol 1990; 17: 506-9. Stricklin SM, Stoecker WV, Oliviero MC, et al. Cloudy and starry milia-like cysts: How well do they distinguish seborrheic keratoses from malignant melanomas? J Eur Acad Dermatol Venereol 2011;25:1222-4. Kechijian P, Connors RC, Ackerman AB. Trichoepithelioma vs. basal-cell carcinoma: Criteria for histologic differentiation. J Dermatol Surg 1975;1:22-23. Carr RA, Sanders DS. Basaloid skin tumours: Mimics of basal cell carcinoma. Curr. Diagn Pathol 2007;13:273–300. Arits AH, Parren LJ, van Marion AM, et al. Basal cell carcinoma and trichoepithelioma: A possible matter of confusion. Int J Dermatol 2008;47:13-17.